Doors open at 7 PM. First set at 8 PM. 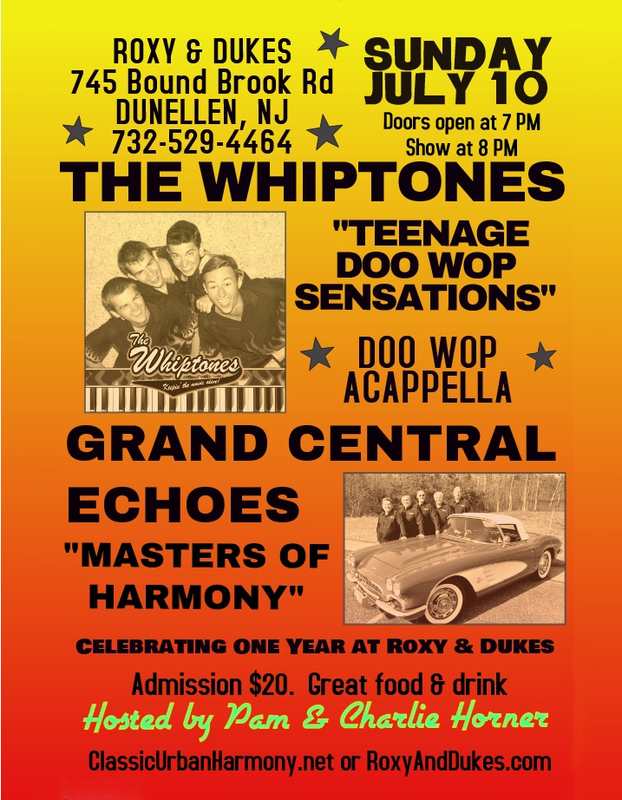 On Sunday night, July 10, we’re celebrating Classic Urban Harmony’s one year anniversary of doo wop & R&B acappella harmony at Roxy & Dukes in Dunellen, NJ, and what a celebration it will be. Two fabulous groups – The Whiptones and Grand Central Echoes. The Whiptones are the teenage singing sensations who sang the National Anthem acappella at the Mets’ opening game last year. It’s great to see young voices stepping up to preserve the legacy of our music. Sharing the stage with the Whiptones, will be Grand Central Echoes, a vocal group that formed back in the UGHA days. Together, the members of this group bring decades of experienced singing to Roxy & Dukes. We call Grand Central Echoes the “masters of harmony”. We’re giving out special anniversary souvenirs to the first 50 paying admissions (think vinyl). Great door prizes! As usual, there’s free parking and great food and drink available. Admission is $20 at the door. Doors open at 7 PM and the first set is at 8. We expect a full house for our anniversary so email us at CUH@att.net and we’ll hold you a seat. Thanks for a great year. Hope to have many more!